Let me tell you about the experience my boyfriend and I had at the Chrysler Jeep dealership. We came in around 5:30 Friday night, took a 2011 Grand Cherokee for a good test drive, fell in love so my boyfriend bought it. In the process of buying it a man came in screaming with how horrible everyone is and how terrible the service is and Im mad that we didnt take that man seriously. So we are driving the car home on the highway going about 100km and the whole car just starts to vibrate, I was literally shaking in the passenger chair. So we call our sales rep immediately and tell him whats going on and tells us to bring the car back Saturday morning. I bring the car in Saturday morning and they took it for a drive themselves and said the reason it shakes is because the tires are "mud tires" but the sales rep said they were going to take a closer look at the car and see if the tires needed to be balanced and check to make sure nothing else was going on. So I sat there for 2 hours and finally they said nothing was wrong, the tires were balanced, the car is 100% safe and the shaking is normal due to the "mud tires". So I take the car back home and do some research on the tires that are on the car and guess what! THEY ARE NOT MUD TIRES. I call around to a couple tire places and ask them about the tires I have on my car and if the tires would make the car shake, all of there answers were no. They also said by the sounds of it the tires needed to be balanced (which apparently was looked at while I sat there for 2 hours). So I call the sales rep back and let him know about the research I had done and he still continued to tell me that the car is perfectly fine. My boyfriend then takes the car to Kaltire where the tires were NOT BALANCED, they were off by 2oz on each tire. Thank you to Kaltire when we drive the car, it now doesnt shake and is now properly balanced. These sales men at Chrysler and Jeep are HUGE liars. So its now Sunday and the check engine light comes on! So of course we call them to let them know about this and luckily we still have 500kms left under warranty, BUT my boyfriend has to go up to work in Kelowna so by the time he would get up there, there would no longer be any warranty on the car. When we call them they told us to bring it in but they cant promise they are going to fix anything....This is absolutely disgusting that they think they can get away with this kind of service, this is why I am going to make sure everyone knows how they are going to get treated when they go to Chrysler Jeep dealership in the Richmond Auto Mall. Late night looking . Would have been better is security guard in clunky Land Rover didnt keep going around staring at me and my Mom as if we were thieves. It is an auto mall after all & it was just passed 9pm on a Wednesday. Also didnt like the fact all the vehicles didnt have the prices on them. Seems counterintuitive. Every dealer had a bunch of vehicles with no prices. North Shore Auto Mall is much cleaner and safer feeling. A bit sketchy around the Hyundai dealership & the Jeep dealership. Too dark. Some unfinished construction around mall also. Lastly its a bit of a labyrinth with all its turning circles. It was mostly ok though. I was looking for a truck. I drove this 2016 Ram and it felt like driving a big bulky plastic box. So then we talked numbers and i was blown away by the cost of that piece of junk. The sales man was a cocky and fake guy and made my time there not pleasant at all. He was so pushy and he ended up being so rude afterwards cause i didt wanna buy. I ran away from that place and i did not look back. I went to Coastal Ford in Burnaby the day after and i bought a beautiful Ford F150 2017 and i got the best service of my life. Shop around and think twice before making a big purchase. A typical auto mall. Plenty of parking at each individual dealership. They have both high end and entry level brands. There is a shuttle service from various parts of Richmond to here and vice versa. Transit from Vancouver and Richmond is also available though the service is slower. They have limited good options here, but the area is being renovated to add more options. They have car services here as well, such as detailing, limited body work etc. Rich asians have absolutely made it impossible to get a salesperson to be even remotely interested in making a sale. They wont even try to negotiate because they know within 5 minutes, someone else will walk in and pay full asking price without even negotiating. Salespeople couldnt even be bothered to get up and greet you. Do your research online, go to the Richmond auto mall to see the car physically, buy it in Maple Ridge or Surrey. We went to many dealerships in the Richmond Auto mall to purchase a vehicle and found that most sales people were very rude. 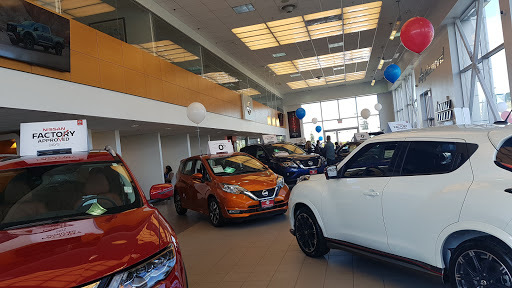 When we walked into the Nissan dealership, we were welcomed with open arms. We were greeted by Jason and Karen and they dealt with all ours needs in a professional manner. We ended up walking out with a Brand new 2016 Nissan Juke! We will be referring our family and friends to Nissan! Too bad BMW is gone, Mercedes soon to follow. It has most of the major brands in one place so it was nice to just be able to walk to all the dealerships. A lot of wild rabbits in the mall too! Due to a lack of manpower (holidays and sick time) service today has been very slow. Possibly the dealers fault for scheduling in too many customers for the available manpower. Very pretentious salesmen. I guess they sell enough cars and dont care anymore because they already did enough on commission. Good for them. Bad for customers. What an awesome place to see cars. Just be careful in the inside roads as theres always someone test driving a car and probably speeding because who wouldnt. Biggest selection of cars dealers in BC, and all located in one spot. No need to go anywhere else. Best place to see them all and compare. Big place with lots of different stores with mostly new cars, but also with a fair amount of pre-owned vehicles in great shape!